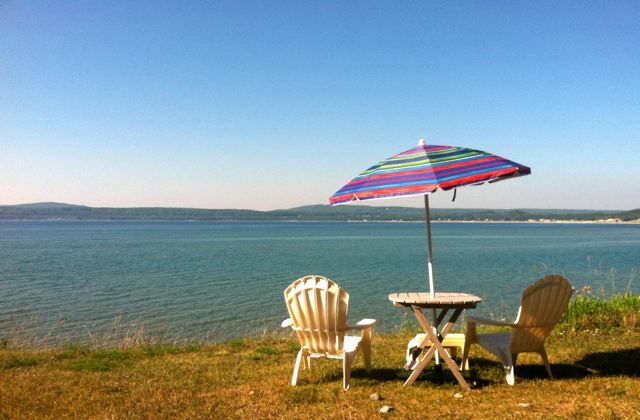 Beautiful Petoskey! I’ve been resting here since my birthday walk-a-thon. I’ve walked from the campgrounds along Lake Michigan into town. Mom, Grandma, Sarah and her friend came and visited me yesterday. When Sarah saw me she said “I thought you’d look worse!” so I made sure to show off my blisters, scratches and bruises. Mom gave me a GPS, which I reluctantly accepted since I lost my last one. She also gave me a huge pile of other birthday gifts, which was nice but mostly frustrating. It’s not that I don’t appreciate the gesture and its not that I don’t like what she gave me but I am carrying everything on my back and this trip is not about stuff. I am grateful for Mom’s generosity but getting gifts like that makes me feel icky. The farther I hike the more remote my surroundings will be- from the relatively populated Traverse City area to the tourist hub of Mackinaw, into the true wilderness of the Upper Peninsula, my trail will become more raw as I gain experience. I wonder if I’ll make it all the way to Copper Harbor and Isle Royale. This week has been hard but I have had the safety net of nearby towns and even my family nearby to offer support if I need it. I look forward to slipping away from those supports. I want to test myself even more. Since I’ve been in Petoskey I’ve had my phone available to me pretty much as much as I want it and I’ve wanted it a lot. I feel extremely lonely for social contact, especially with guys. I’ve binged on Facebook and can feel myself needy for validation about what I’m doing. This trip is objectively awesome! Why do I need other people to tell me so? It’s reminder that I still have to work on my strength of self but it’s also a lesson that sometimes a solution can create it’s own problems. This trip might help me be better able to spend time alone but it might also create a social deficit that I’ll need to make up for later. I’m enjoying a new feeling that may be natural to other but is new to me- a sense of cause-and-effect when it comes to what I put in my body. That simple system was imbalanced after years of bulimia. Every time I purged, I effectively annulled the consequences of what I ate. I was cheating. Today I decided to give away the Swiss Miss packets Mom delivered even though they’d taste good and were sugar-free, so negligible calorically. Since they didn’t offer any nutrition they aren’t worth bringing (not to mention that I don’t want to have one of those fake-sugar induced craps when I’m in the woods!). I need my body to perform, I need it to do what I ask of it, and I want it to be as painless as possible so I am going to try to treat it in the best way possible. I feel I like I’m regaining humanity again! Safety. Most of the time I don’t really need the poles for support, but every once in awhile I slip on mud or trip on a root and my poles have saved me from a fall a few times already. Falling can mean twisting an ankle or damaging gear or just destroying my morale. Grooming. I’ve been using my poles lately to clear my path. Raspberries bushes are all over the place and, while the berries aren’t in season, the thorns are! I use the poles like a little plow to guide them away. Less evil but more common are the ferns. Since these trails aren’t heavily traveled or maintained and ferns grow so quickly, the paths are covered in ferns for mile after mile. Bug-swatting. With each step, my poles swing past my legs, a considerable obstacle for any would-be bug bites. Distraction. Every two steps is one stab of a stick so both poles hit the ground while the same foot is landing. Unless I force it, my poles “step” with my right foot. Seems weird for a Lefty right? If I’m bored, I try to make myself “step” my poles with my left foot and it’s a lame, but effective way to kill time. Daydreaming. Sometimes I think of myself as a state-wide aerator, like I’m not walking for myself but out of a deep sense of purpose to oxygenate the dirt. I’m like the Johnny Appleseed of poking holes in the ground! I’m surprised at how how easy it is to escape from being seen. People are clustered together and since we spend most of our time in these clusters, we don’t realize how much open space is out there. It reminds me of the train ride from Ann Arbor. Within 10 minutes the ride passes through Dexter and Chelsea but each town lasts only a few seconds, the rest is woods. Through most of my life I have lived in those three towns but most of my time has been spent within those seconds-long blurs rather than the untamed nature in between. This entry was posted in Left of East, Non-Fiction, Relationships and tagged Leftofeast, michigan, north country trail, petoskey. Bookmark the permalink.